The films of David Gatten brand the brain and the retina with equal force. They consist partly of cerebral puzzles and partly of lyrical reveries, and their central drama lies in the space between, where facts transform into poetry and transient experiences are assimilated into systems of knowledge. Gatten's yet-to-be-completed film cycle Secret History of the Dividing Line, a True Account in Nine Parts (1999-present)—which is playing at Gladstone Gallery this week as part of an exhibition titled "The Unfinished Film"—takes as its main character William Byrd II, an 18th-century Virginian aristocrat, plantation owner, and author whose library is said to have been the largest and most varied in the colonies. Secret History uses Byrd, his family, and his library to explore the transmission of knowledge across ruptures of history, vagaries of translation, the appeal of rational enquiry, the dissolution of rationalism, the perils of mysticism, and the ineradicability of spiritual yearning. The first film in the cycle, Secret History of the Dividing Line (2002), begins with a text, sometimes flashing by, sometimes lingering, that gives a brief account of the Byrd family set against an elliptical telling of the emergence of Modernity. Galileo, Newton, and Pasteur are mentioned, along with Graham Bell, Edison, and the Wright Brothers; Locke and Marx and Engels; Chaplin, Joyce, and Jack the Ripper. 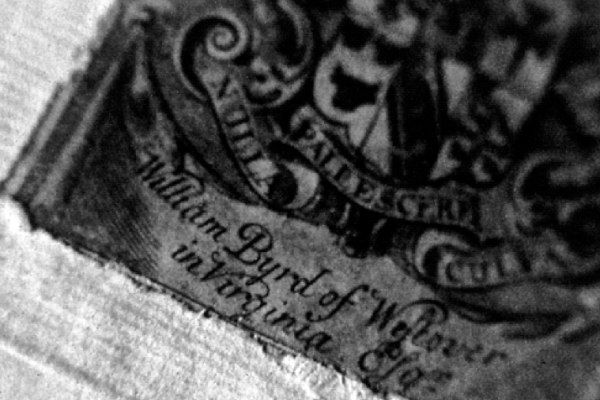 The middle section of the film shows a frantic line that tears across the screen, sometimes revealing text from William Byrd's book The History of the Dividing Line—which recounts the surveying of the border between North Carolina and Virginia—and sometimes revealing text from Byrd's Secret History of the Line, a more gossipy version of the same story. The third section of the film shows bright white lines spotted with biomorphic abstractions. The dividing of territory is portrayed as writing with earth, codifying land as a language. The story of Enlightenment thought offered as a backdrop in the first section becomes a similar series of marks, a divvying up of thoughts and ideas, a surveying of mental life; the dividing lines of the last section are the truly secret history because, while many previous texts are rendered impossible to read by the speed at which they pass, the last images in their essence push inscription toward illegibility. At times they seem geological, formed by epochal tectonic shifts, at others subatomic, microscopic details from a scientific laboratory. But their meaning remains unstable, or unsummarizable. One could say that for Gatten images gain their integrity as images when they become illegible as words and that this illegibility necessitates a confrontation with contingency and makes possible an openness to a way of knowing the world outside the strictures of language and its brethren: science, logic, and mathematics. These disciplines are always appearing in Gatten's films, and they're always doubling back on themselves and being delimited. What binds the world of his films together is longing, not reason; reason is actually just a peculiarly beautiful repository for longing, a longing for order and progress. Gatten's work, which is often concerned with the past, is very contemporary in the way it synthesizes and forefronts a broad range of influences. He draws heavily from the two poles of American avant-garde cinema of the '60s and '70s represented by Stan Brakhage and Hollis Frampton. In different ways, both filmmakers conceived of a project of image making that had an antagonistic relationship to language. Brakhage theorized a prelapsarian mode of seeing untainted by language and society's conditioning; wild gesturalism and associational editing were attempts to re-access the joyful visions of infanthood that were lost with the acquisition of words, which cause us to find similarity where we should find difference and difference where we should find similarity. Frampton proposed to find a grammar for images that could best language at the game of ordering the world; structures for pictures were devised that might be better in tune with the world of Platonic forms than what he called "the machine of language." Frampton strategically used words in his middle period films—most famously in Zorn's Lemma, which is composed mostly of pictures of words—and he used them to invite doubt and generate riddles. Gatten's swiveling between idea and lyric can be seen on one level as mediation between these two influences, playing one off the other: an attempt at reconciling the Apollonian Frampton and the Dionysian Brakhage. But Gatten's influences aren't confined to the world of experimental cinema. The Abstract Expressionist work that helped fuel Brakhage has a direct line to Gatten's images. If Brakhage owes more to this work formally, Gatten may owe more ideologically, with his frequent reduction of art to the isolated act of mark-making and his treating of the mark as a problematic locus of meaning, the origin point from which any sign must emerge. But Gatten's films also necessarily recall the conceptual art movement, which stood against Abstract Expression, or at least against its critical champion Clement Greenberg. Gatten's concern with the push-pull between dissolving objects into ideas and embodying language as material has affinities with the work of Lawrence Weiner, and his use of elaborately contrived randomness recalls Sol LeWitt and other conceptualists. His ends are wildly different, and in fact his work could be seen as failed conceptual art animated by its own failure; that is, work in which ideas appear to take precedence, only to be perpetually superseded by physicality. Gravity comes into being when an element is placed above another more rarefied element. While they're conceptually maximalist, Gatten's movies partake of a visual minimalism, if not in texture than in color palette. The first three parts of Secret History are rendered only in stark black and white, with sections of total darkness and slashes of blinding light. No Hollywood director, no matter how big his or her budget, offers images as carefully calibrated as Gatten's. As they construct around them gigantic conceptual edifices, his films contain sequences that decompose mental activity, obliterate the formation of thoughts. In Moxon's Mechanick Exercises, or the Doctrine of Handy-works Applied to the Art of Printing (1999), the third section of Secret History, though the first to be completed, text from the Gutenberg Bible dances across the screen, forming abstract patterns that coalesce and then atomize. Constituent elements of this symbol of the democratization of knowledge become the thrum of consciousness, divorced from knowledge and yoked to rhythm and impulse. These traces of the Gutenberg Bible are a reminder of the aptness of the inclusion of Secret History in "The Unfinished Film," which was curated by Thomas Beard. Only the first four sections of the cycle have been completed, with the fifth to come in 2012, so the film is technically unfinished; but its place in the show as a whole is more complex. 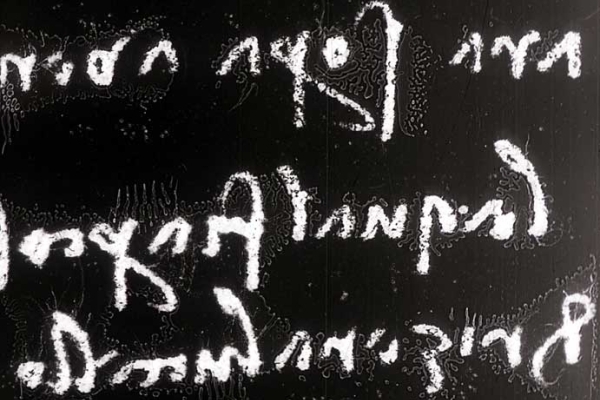 Gatten's work is concerned with lacunae, with how texts are ablated and reconstructed, rendered incomplete simply by changes in the language, perpetually encrypted. The resonance of Beard's show is related to the resonance of a life cut short, but Gatten's Secret History suggests something else: the idea that time will, eventually, unfinish all our works.